Run your players through your average dungeon. Ask them to map and don't correct their errors. Next party, run them through the dungeon using the first party's map as the literal dungeon. Repeat. I wonder what the dungeon would eventually look like. My guess is that it what devolve into a 10' corridor in a square with rooms off of it. Maybe eventually eroding into a single straight hallway with a few rooms. Alternate experiment run another DM's dungeon making clear additions and revisions to your own taste, then pass it to another DM who will do the same, and so on. What would that dungeon eventually become? I have a feeling it would look very much like a megadungeon made by a mad archmage with giants in rooms next to orcs with pies. I'm not certain of that though. Maybe it would be come more bland over time, something like caves of various humanoids. 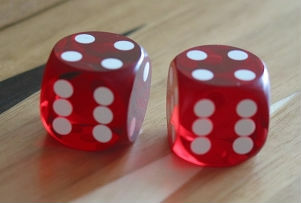 I'm ashamed that I consider myself a lover of precision dice and didn't know until last week that you can actually buy nice round-faced backgammon dice that are milled from acrylic like casino dice. They are pricey, but I'd like to buy some eventually. I almost made a whole post for this but I'm not sure how many Minecraft players I have as readers. Imagine a procedurally-generated sandbox game that you can build whatever you want, like Lego. What do you do? It seems after mastering the early survival phase of the game people often crave challenge created by human brains. You can download free maps made by people. There are several types of these, but the most popular by far, are called CTM maps, or "Complete the Monument". So, they give you a clear goal, find 16-19 doodads and bring them safely to a particular place. What interests me most is the conventions that have become accepted through play. First, there is no pretense at a natural setting or reason for areas, like a megadungeon, you just have snow-themed area A over here and Lava Lake B over here because. However, these are laid out on a very clear grid pattern with intersections. The intersections have four directions and each are is named with signs. It seems players getting lost is considered the height of unfun. Another odd custom, is that the main threat of these maps, monster spawners which can be destroyed or disabled by lighting them up, are put out in clear sight. Sometimes they might be hidden behind one layer of shallow wall, but the courteous convention seems to be making sure players know exactly what threats lie ahead of them and where. I'm not sure what to make of this. On one hand I have the feeling these are attempts to set up challenges that don't require you reading the Map-makers mind, which is great. On the other hand there is a weird contradiction here of players clamoring for difficult, but not too difficult challenges. The maps have a reputation as being hard, the most well known series being called "Super Hostile," yet there are chests placed about with resources and weapons for the player in phases of the map where they will need them. This gives the whole thing a very video-gamey Super Mario feel to me. There might be some of the same balancing of threats to capabilities in my own games but I like to think I try to hide it behind the veneer of plausible verisimilitude. p.s. Almost have my Secret Santicore request finished. Just one more idea to nail down then I'll mail it off. I'll blog about it after the collection comes out-- I think surprise is part of the fun of the endeavor. Re: Dungeon Telephone, I've always liked the idea of a "Chinese Whispers Megadungeon", where you start with a map of level 1, sparsely populate it however you like, then pass it to the next person, who makes as many or as few changes or additions as they please before passing it on again. When it completes the circuit, the original writer can make a few changes to tie it all together, then you start over with another level. I feel like it could produce a very well filled-out dungeon for very little individual effort. Love the Dungeon Telephone ideas. I don't think the second one would settle down to a particularly interesting type as the number of handovers approached infinity though. My feeling is it might be something like one BBEG, one magical pool/fountain, two factions of humanoids, three traps. That's assuming each DM is concerned mainly with "feasible ecologies" and views each received dungeon with peevish disdain. @John: Thats a way to make it a viable collaborative technique instead of just a notion. You should try it with someone. Although, would you want to work with folks of similar tones and mindsets, or a variety? @Andrew: Yeah, that was kind of my thinking, over time it would be homogenized to the most common tropes. @TC I don't have enough DM friends or web associates to really pull it off. If I did do something like it, I think a variety of collaborators would work best - everyone can adjust the final product to their personal taste before using it, after all.